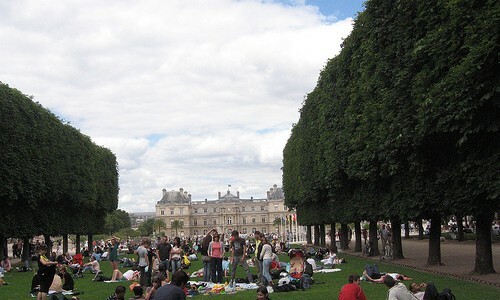 Below you’ll find our suggestions for where to pick up cheese, sweets, wine and other picnic provisions before you pick out a sunny bench in the Luxembourg Gardens. Fromagerie Sanders – A friendly, family-run fromagerie in the covered Marché Saint Germain. Laurent Dubois – Fromager Laurent Dubois is a Meilleur Ouvrier de France. Gilles Verot – Pâtes, terrines, saucisson, jambon…get all the best meaty bits from this beloved charcutier. Poilâne – One of the great bakeries of Paris, and not a baguette to be found. The slightly sour miche can be ordered by the tranche (slice) and makes a fabulous edible plate. Thierry Renard – Award-winning baker Thierry Renard set up shop on rue de Cherche Midi in early 2012. Cosi – The sandwiches at this unique shop (it’s not the American sandwich chain) are made with a focaccia-like bread, right from the oven, with fresh fillings and plenty of vegetarian choices. Several salads for takeaway as well. Open every day. Patrick Roger – The clean lines of Roger’s shop show off his bold style and playful displays. Contemporary flavors like lemongrass and Sichuan peppercorn mix with classic pralines, dark ganaches, and caramels. A Meilleur Ouvrier de France. Henri Le Roux – Master chocolatier and “caramelier” Henri Le Roux has just opened up a shop in Paris. Salted butter caramel fans, rejoice. Sadaharu Aoki – Master pâtissier Sadaharu Aoki combines French techniques and Japanese flavors. Franck Kestener – This Lorraine-based chocolatier (a Meilleur Ouvrier de France) opened a boutique in Paris in late 2010. La Grande Épicerie – The food hall of department store Le Bon Marché, offering fresh prepared food, beautiful bottles, and fine groceries for chic one-stop shopping. Bread & Roses – An English-accented bakery, lunch spot and tea salon featuring fresh tarts (savory and sweet), sandwiches, and lively salads, plus flaky scones, serious cheesecake, and a few grocery items. La Dernière Goutte – Terroir-driven, estate-bottled, organic and biodynamic wines from small producers, are the specialty at this beloved shop, run by Juan Sanchez. Bacchus et Ariane – You’ll find natural and biodynamic wines from small producers, and a nice selection of growers Champagnes at this wine shop in the covered Marché Saint Germain, where you can also drink on the spot. Les Papilles – You may never make it to your picnic once you see the food served at this wine bar/epicerie/restaurant. But if you can tear yourself away, snag a bottle of wine from the shelves and maybe some cured meats from the delicatessen. Caves du Panthéon – Nearly 100 years old, this shop offers stacks and stacks of estate-bottled wines from all regions of France. Le Vin en Tête – This user-friendly shop, open every day, features mostly organic and natural wines, as well as a selection of big, classic names. La Grande Épicerie at Le Bon Marché – The food hall of department store Le Bon Marché, offering fresh prepared food, beautiful bottles, and fine groceries for chic one-stop shopping.